Conference Series llc LTD invites all claimants to attend “12th International Conference on Tissue Engineering & Regenerative Medicine” which is going to be held during November 11-12, 2019 at Madrid, Spain mainly focuses on two key topics viz. Tissue Engineering and Regenerative Medicine with basic theme “Regenerative Medicine: Power to Repair, Rejuvenate, Renew”. Regenerative Medicine -2019 provides an ideal environment to discuss on recent approaches in Tissue Engineering and Regenerative Medicine for disease remediation and tissue repair. 12th International Conference on Tissue Engineering & Regenerative Medicine mainly focuses on Stem Cell Research and Tissue Engineering. Stem cell Research includes stem cell treatment for various disease and conditions include Diabetes, Rheumatoid arthritis, Parkinson's disease, Alzheimer's disease, Osteoarthritis, Stroke and traumatic brain injury repair, Learning disability due to congenital disorder, Spinal cord injury repair, Heart infarction, Anti-cancer treatments, Baldness reversal, Replace missing teeth, Repair hearing, Restore vision and repair damage to the cornea, Amyotrophic lateral sclerosis, Crohn's disease, Wound healing, Male infertility due to absence of spermatogonial stem cells etc., Tissue Engineering includes Bone tissue engineering, soft tissues, tissue imaging, Tissue implant, Cartilage and skin defects are a special focus along with applying basic science and engineering principles from diverse areas towards solving clinically pertinent biomedical problems. Conference Series llc LTD is a World’s leading Event Organizer that organizes 1000+ Global Events inclusive of 300+ Conferences, 500+ Upcoming and Previous Symposiums and Workshops in USA, Europe & Asia with support from 1000 more scientific societies and publishes 700+ Open access journals which contains over 30000 eminent personalities, apparent scientists as editorial board members. Scaffolds are one of the three most important essentials constituting the basic concept of Regenerative Medicine, and are included in the core technology of Regenerative Medicine. Every day thousands of surgical procedures are done to replace or repair tissue that has been damaged through disease or trauma. The developing field of tissue engineering (TE) aims to regenerate damaged tissues by combining cells from the body with highly porous scaffold biomaterials, which act as templates for tissue regeneration, to guide the growth of new tissue. Scaffolds has a prominent role in tissue regeneration the designs, fabrication, 3D models, surface ligands and molecular architecture, nanoparticle-cell interactions and porous of the scaffolds are been used in the field in attempts to regenerate different tissues and organs in the body. The world stem cell market was approximately 2.715 billion dollars in 2010, and with a growth rate of 16.8% annually, a market of 6.877 billion dollars will be formed in 2016. From 2017, the expected annual growth rate is 10.6%, which would expand the market to 11.38 billion dollars by 2021. Recently, cord blood stems cells are developed in the treatment of different diseases, including a broad range of cancers, blood disorders, and genetic diseases. In a cord blood transplant, stem cells are infused in to a patient’s bloodstream for healing and repairing damaged cells and tissue. In a successful transplant, new healthy immune system has been created. The natural power and purity of newborn's cord blood are responsible for healthy development during gestation. Cord blood applications have developed beyond transplant medicine into the areas of regenerative medicine including brain injuries, autism, Cardiac Problems, and Autoimmune Deficiencies. The latest research in routine transplantation of cord blood are reviewed followed by the critical role of cord blood stem cells in regenerative medicine research and novel approaches using cord blood as a source of whole blood for transfusion. California Institute for Regenerative Medicine (CIRM); New York Stem Cell Foundation (NYSCF); Tissue Engineering International & Regenerative Medicine Society (TERMIS); International Society for Stem Cell Research (ISSCR). The New South Wales Stem Cell Network; Korean Society for Stem Cell Research; Japanese Society for Regenerative Medicine; Taiwan Society for Stem Cell Research; Stem Cell Society Singapore (SCSS). This interdisciplinary engineering has attracted much attention as a new therapeutic means that may overcome the drawbacks involved in the current artificial organs and organ transplantation that have been also aiming at replacing lost or severely damaged tissues or organs. Tissue engineering and regenerative medicine is an exciting research area that aims at regenerative alternatives to harvested tissues for organ transplantation with soft tissues. Although significant progress has been made in the tissue engineering field, many challenges remain and further development in this area will require on-going interactions and collaborations among the scientists from multiple disciplines, and in partnership with the regulatory and the funding agencies. As a result of the medical and market potential, there is significant academic and corporate interest in this technology. Stem cell transplant is treatment in some types of cancers like leukemia, multiple myeloma, or some types of lymphoma. Stem cell transplantation is the procedure that restores blood-forming stem cells in patients who have had theirs destroyed by the very high doses of chemotherapy or radiation therapy that are used to treat certain cancers. Biomaterials are being utilized for the social insurance applications from old circumstances. In any case, consequent development has made them more flexible and has expanded their utility. Biomaterials have reformed the territories like bioengineering and tissue designing for the advancement of novel methodologies to battle perilous infections. Together with biomaterials, immature microorganism innovation is additionally being utilized to enhance the current human services offices. These ideas and innovations are being utilized for the treatment of various maladies like cardiovascular disappointment, cracks, profound skin wounds, and so forth. Presentation of nanomaterial’s then again is turning into a major seek after a superior and a reasonable social insurance. Mechanical headways are in progress for the advancement of persistent observing and controlling glucose levels by the implantation of sensor chips. There are many applications of Tissue engineering but majorly they are used in Organ Transplantation and Therapeutic Cloning like Bio Artificial liver device, artificial pancreas, artificial bladders, and Cartilage. When there is damage in our body cells or organs we use tissue engineering techniques to overcome the damage by replacing the old cell. There is wide range of Tissue Engineered product or materials which are used to cure diseases in human and save life. Cancer stem cells (CSCs) are cancer cells (found within tumors or hematological cancers) that possess characteristics associated with normal stem cells, specifically the ability to give rise to all cell types found in a particular cancer sample. CSCs are therefore tumorigenic (tumor-forming), perhaps in contrast to other non-tumorigenic cancer cells. CSCs may generate tumors through the stem cell processes of self-renewal and differentiation into multiple cell types. Such cells are hypothesized to persist in tumors as a distinct population and cause relapse and metastasis by giving rise to new tumors. Therefore, development of specific therapies targeted at CSCs holds hope for improvement of survival and quality of life of cancer patients, especially for patients with metastatic disease. German Stem Cell Network (GSCN); German Society for Stem Cell Research (GSZ); Stem Cell Network North Rhine-Westphalia (NRW); ScanBalt Stem Cell Research Network; EuroStemCell (European Consortium for Stem Cell Research); Norwegian Center for Stem Cell Research (NCSCR); British Association of Tissue Banks. Regenerative Medicine Foundation; American association of tissue banks; California Institute for Regenerative Medicine (CIRM); New York Stem Cell Foundation (NYSCF); Tissue Engineering International & Regenerative Medicine Society (TERMIS). Asia Pacific Association of Surgical Tissue Banking; Japanese Society for Regenerative Medicine; Taiwan Society for Stem Cell Research; The New South Wales Stem Cell Network; Korean Society for Stem Cell Research. Tissue engineering of musculoskeletal tissues, particularly bone and cartilage, is a rapidly advancing field. In bone, technology has centered on bone graft substitute materials and the development of biodegradable scaffolds. Recently, tissue engineering strategies have included cell and gene therapy. The availability of growth factors and the expanding knowledge base concerning the bone regeneration with modern techniques like recombinant signalling molecules, solid free form fabrication of scaffolds, synthetic cartilage, Electrochemical deposition, spinal fusion and ossification are new generated techniques for tissue-engineering applications. The worldwide market for bone and cartilage repairs strategies is estimated about $300 million. During the last 10/15 years, the scientific community witnessed and reported the appearance of several sources of stem cells with both osteo and chondrogenic potential. European Association of Tissue Banks; Norwegian Center for Stem Cell Research (NCSCR); ScanBalt Stem Cell Research Network; Danish Stem Cell Society (DASCS); Stem Cell Network North Rhine-Westphalia. The Swiss Stem Cell Network; Danish Stem Cell Society (DASCS); Stem Cell Network North Rhine-Westphalia. EuroStemCell (European Consortium for Stem Cell Research); German Stem Cell Network (GSCN); ScanBalt Stem Cell Research Network; European Calcified Tissue Society; European Association of Tissue Banks. Adult Stem Cell Research Network (ASCR); International Society for Stem Cell Research (ISSCR); California Institute for Regenerative Medicine (CIRM); New York Stem Cell Foundation (NYSCF); American association of tissue banks; Tissue Engineering International & Regenerative Medicine Society (TERMIS). Asia:Asia Pacific Association of Surgical Tissue Banking; Japanese Society for Regenerative Medicine; Taiwan Society for Stem Cell Research; The New South Wales Stem Cell Network; Korean Society for Stem Cell Research. Stem Cell Network North Rhine-Westphalia; German Stem Cell Network (GSCN); German Society for Stem Cell Research (GSZ); Stem Cell Network North Rhine-Westphalia (NRW); Norwegian Center for Stem Cell Research (NCSCR); European Tissue Repair Society; Spanish Association of Tissue Bank. International Society for Stem Cell Research (ISSCR); Tissue Engineering International & Regenerative Medicine Society (TERMIS); Adult Stem Cell Research Network (ASCR); California Institute for Regenerative Medicine (CIRM); New York Stem Cell Foundation (NYSCF); Regenerative Medicine Foundation. Danish Stem Cell Society (DASCS); Stem Cell Network North Rhine-Westphalia; German Society for Stem Cell Research (GSZ); Stem Cell Network North Rhine-Westphalia (NRW); Spanish Association of Tissue Bank; European Calcified Tissue Society; European Association of Tissue Banks. Adult Stem Cell Research Network (ASCR); California Institute for Regenerative Medicine (CIRM); New York Stem Cell Foundation (NYSCF); Tissue Engineering International & Regenerative Medicine Society (TERMIS); International Society for Stem Cell Research (ISSCR); Regenerative Medicine Foundation. Currently, it has emerged as a rapidly diversifying field with the potential to address the worldwide organ shortage issue and comprises of tissue regeneration and organ replacement. Regenerative medicine could potentially save public health bodies money by reducing the need for long-term care and reducing associated disorders, with potential benefits for the world economy as a whole. The global tissue engineering and regeneration market reached $17 billion in 2013. This market is expected to grow to nearly $20.8 billion in 2014 and $56.9 billion in 2019, a compound annual growth rate (CAGR) of 22.3%. On the basis of geography, Europe holds the second place in the global market in the field of regenerative medicine & tissue engineering. In Europe countries like the UK, France and Germany are possessing good market shares in the field of regenerative medicine and tissue engineering. 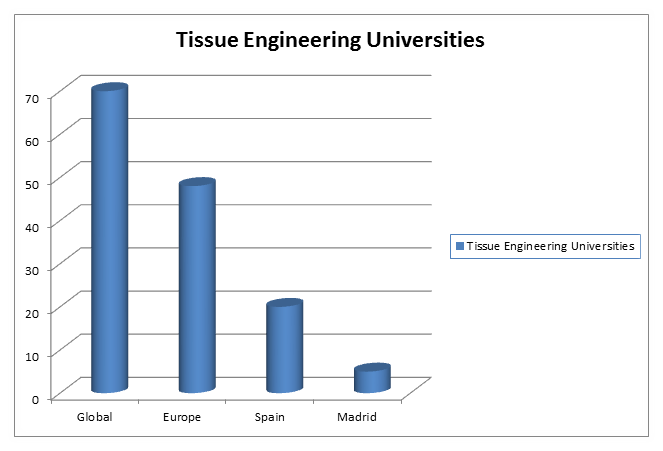 Spain and Italy are the emerging market trends for tissue engineering in Europe. A novel set of tissue replacement parts and implementation strategies had shown a great revolution in this field. Cells placed on or within the tissue constructs is the most common methodology in tissue engineering. This field continues to evolve. In addition to medical applications, non-therapeutic applications include using tissues as biosensors to detect biological or chemical threat agents and tissue chips that can be used to test the toxicity of an experimental medication. Tissue Engineering and Regenerative Medicine is the major field of Medicine, which is still under research and the advancements are maximizing day to day. Regenerative Medicine 2019 is an engrossed a vicinity of cognizant discussions on novel subjects like Scaffolds, Tissue Regeneration, Tissue engineering & 3D printing, Cord blood & Regenerative medicine, Bone & Cartilage Tissue engineering, Stem cells to battle cancer, Tissue bioreactors, Tissue chips & Biochips, Immunotherapy, Clinical medicine, to mention a few. The three days event implants a firm relation of upcoming strategies in the field of Tissue Science & Regenerative Medicine with the scientific community. The conceptual and applicable knowledge shared, will also raise organizational collaborations to nurture scientific accelerations. We bring together Researchers & Scientists, business, creative & technology leaders from the tissue engineering, marketing for the most current and relevant. Meet Your Target Market With members from around the world focused on learning about Advertising and marketing, this is the single best opportunity to reach the largest assemblage of participants from the tissue engineering and regenerative medicine community. The three days event implants a firm relation of upcoming strategies in the field of Tissue Engineering & Regenerative Medicine with the scientific community. Conduct demonstrations, distribute information, meet with current and potential customers, make a splash with a new product line, and receive name recognition. USA: Regenerative medicines market by therapy (cell therapy, gene therapy, immunotherapy, tissue engineering), region - global forecast to 2021, the global regenerative medicines market size is expected to reach USD 49.41 billion by 2021. Europe: The global tissue engineering and regeneration market reached $17 billion in 2013. This market is expected to grow to nearly $20.8 billion in 2014 and $56.9 billion in 2019. Asia-Pacific: Asia-Pacific regenerative medicines market is expected to reach USD 10.71 billion by 2021 from USD 3.01 billion in 2016, growing at a CAGR of 28.90% during the forecast period 2016-2021. 11th International Conference on Tissue Engineering & Regenerative Medicine was organized during October 18-20, 2018 at Rome, Italy. The conference was marked with the attendance of Editorial Board Members of supporting journals, Scientists, young and brilliant researchers, business delegates and talented student communities representing more than 25 countries, who made this conference fruitful and productive. The Organizing Committee would like to thank the moderators Elena Butoi, Institute of Cellular Biology and Pathology, Romania (Day 1, 2 &3) for her contribution which resulted in smooth functioning of the conference. Conference Series LLC has taken the privilege of felicitating Regenerative Medicine 2018 Organizing Committee, Editorial Board Members and Keynote Speakers who supported for the success of this conference. The esteemed guests, keynote speakers and researchers shared their innovative research and vast experience through their informative presentations at the podium of Regenerative Medicine 2018. We are glad to inform that all accepted abstracts for the conference have been published in Journal of Tissue Science & Engineering: Open Access as a special issue. We are also obliged to various experts, company representatives and other eminent scientists who supported the conference by facilitating the discussion forums. We sincerely thank the Organizing Committee Members for their gracious presence, support, and assistance. With the unique feedback from the conference, Conference Series LLC would like to proudly announce the commencement of the "12th Annual Conference on tissue engineering and Regenerative Medicine" to be organized during November 11-12, 2019 at Madrid, Spain.